A few weeks ago, I received a phone call from hero and friend, Paul Chatlin. Paul checks in every few months and his words are highly valued. As the voice mail played, in crept the realization that Paul had no idea we’d wandered to San Francisco so, at 40 years old, I could go Dangerfield and go back to school to study Data Analytics & Business Intelligence at MissionU, a startup college alternative. I excitedly returned his call and this article is a product of that conversation; to explore the relationship between data and food. First, a moment to catch up as it’s been a while since the last article. In 2011, Erica (wife) and I viewed Forks Over Knives, which inspired us to Plant Based. In 2014 we created The Wandering Food Pharm to share the message of “Food is Medicine”. Soon we met Paul, became PBNSG “Farming Ambassadors”, and wandered the country reporting on urban farms, producing homemade WhoatsUp Protein Bars, and sharing Whole Food Plant Based information. In April 2017, podcaster Rich Roll interviewed MissionU founder Adam Braun, who described a “debt-free college alternative”. With an unused teaching degree, unpaid student loans, and uninspiring options, this moment resonated deeply. I applied that night, and was among 30 of 5k+ applicants accepted into the 1-year program. Mr. Roll, thank you. I’m most excited to tell the story of data and food. How is data analysis telling a story? An example is using data to better understand impacts. Data is only a tool; the story is crafted by the analyst. Consider North Carolina CAFO pig waste. It can be difficult to imagine the yearly impact of 10 Billion gallons of swine waste. But using available water data we can reinterpret the number. Let’s say 10 Billion gallons of Pig Poo was like water and the residents of North Carolina used Pig Poo to shower. The yearly amount would each week provide one eight-minute shower of Pig Poo to each of 10,000,000 NC residents. Now, that’s a bit easier to digest-thanks data! This excitement drives my current mission: to utilize data to tell a conscious story. Living in the East Bay, Erica scored a job at Berkeley Horticultural Nursery (BHN), a family owned company celebrating 95 years in business. Recently, BHN hosted Dan Lehrer of Little Apple Treats & Flatland Farm for a free “Winter Gardening Class”. Lo and behold, Farmer Dan spoke of data, explaining that the past 9 of 10 years since 2005 have been the hottest on record. How he “used to trust NOAA” every year for the Spring rain predictions, but for the first time in history were incorrect 2 years straight. We’ve heard farmers from Michigan to California echo this climate sentiment; There is no more normal. Thus, extracting “the story” from data proves to be a critical tool to make conscious food choices within an unconscious food system. Welcome Spring! Flowers bloom as gray winter skies are replaced with sunshine. Spring also marks the beginning of Farmers Market season. Across the country, empty parking lots are re-purposed into thriving hubs of activity. With an ever increasing percentage of the population adopting a Plant Based lifestyle, Farmers Markets will supply a larger portion of future food needs. After sampling vegan cookies and devouring plant-based street tacos, we discovered the Bloomin' Desert Herb Farm. 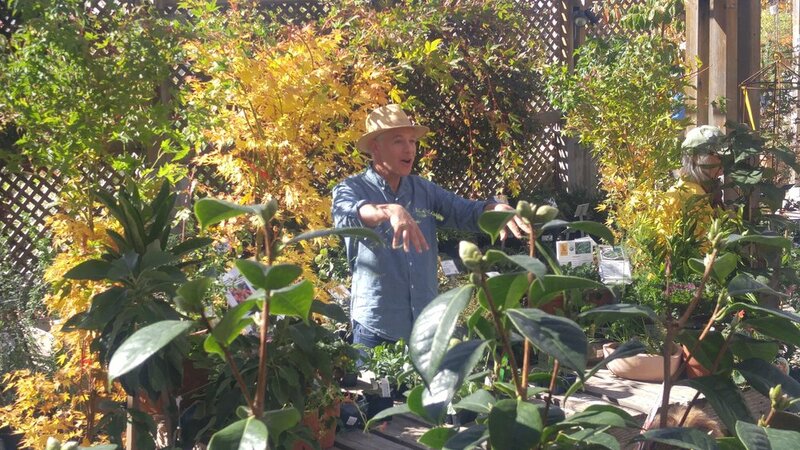 Randy Gibson explained that in nearby Henderson he and wife, Rosalind, grow over 50 varieties of herbs and edible flowers then use the bounty to create the teas, seasonings and more for sale at local farmers markets. Speaking with wild excitement about transforming his typical suburban driveway into a greenhouse and growing waist high basil, Randy noticed our excitement and kindly obliged the request to visit the farm. The Plant-Based road has led to San Antonio, Texas to again work temporarily as stadium seat installers. While construction is not our passion, it's a great opportunity to earn money to fund the Wandering Food Pharm, get physically fit, and spread the Plant-Based message to interested workers. The job includes housing in a historic neighborhood just north of downtown. Exploring the new eclectic hood on foot, we were thrilled to discover the River Road Community Garden and popped in on the 3rd Saturday of the month, the activity day, as noted on the garden chalkboard. In the small town of Cedar Lake, thirty minutes west of the geographical center of Michigan's lower peninsula, the Good News Market & Farm grows fruits and vegetables 'Veganically'. Free from the use of animal products (blood, manures, and bone or fish meals) and using strictly plant-based materials, Veganic farming avoids the potential risks from animal products, like animal-related diseases, contamination, hormones, antibiotics and animal waste run-off. This urban farm not only feeds the stomachs of the community but also the minds, especially of the young. Linda's garden is creating a ripple effect by getting kids to connect with their food, a very important lesson in today's world where food is prepackaged in a factory, often filled with sugar and chemical additives. Part of the Wandering Food Pharm’s mission is to be a resource during this recalibration period via a “Foodtervention,” a guided transition from the Standard American Diet (SAD) to a plant-based lifestyle. Food frustration inspired us to create the Wandering Food Pharm (WFP), a Plant-based Vehicle delivering food as medicine. Equal parts action, activism, and knowledge, the WFP will empower consumers to make conscious food choices within an unconscious food system.